OK, this isn’t strictly a pub, but they do have a beer festival once a year! 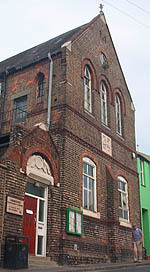 The beer festival and other fundraising events are vital to pay Brighton Council’s rent, and also because age and the wear and tear that comes from constant use is taking its toll on the building, which was originally a Victorian school. I remember a few years ago working as a labourer on the roof of this building. The next time you go past, look up and imagine the view I had from the apex of the roof. Incredible. I was chatting to someone involved in the campaign to create the centre in the 1970s and he told me that the original plan was to make it a casino! Crazy, and so glad that plan was defeated.